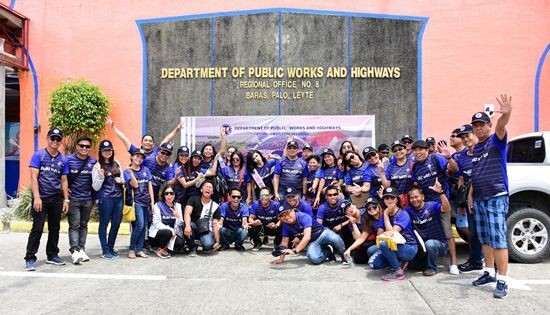 Participants from Biliran District Engineering Office (DEO) are all smile after the parade during the first day celebration of DPWH 120th Anniversary and Sportsfest on June 21, 2018. NAVAL, Biliran – The Department of Public Works and Highways (DPWH) Region VIII celebrates 120th anniversary and sportsfest in a two-day event on June 21-22, 2018 simultaneously with other DPWH Offices nationwide. The activity started with a thanksgiving mass at the open field of the DPWH Regional Office, Baras, Palo, Leyte at 8:00 in the morning officiated by Fr. Norman Abolencia followed by a short parade around the Government Center of Palo. The competition for the Best in Muse highlights the morning event of the first day of celebration. Photo exhibit contest also opens at the DPWH multipurpose hall displaying completed/proposed high impact projects of the 13 district engineering offices. The start of the sports activities at 1:00 in the afternoon, signals the commencement of the sportsfest celebration. Sports competition includes basketball, volleyball, badminton, table tennis, dart and chess but the highlight of the celebration is the Search for Mr. DPWH Sportspoof 2018 in the evening. Fourteen straight men candidates representing their engineering offices came out as lovely ladies vying for the title. In the middle of the said competition, there was a Search for DPWH Curatcha King and Queen. The second day of the celebration starts with the DPWH Unity Fun Run at 5:00 in the morning competing for the 3k, 5k and 10k run. Participants who are not playing any sports competition for this day are enjoying the parlor games prepared by each district offices. The sports championship games also continue on this day. DPWH is celebrating 120 years anniversary with the theme “Bridging Modern Development”. The department started as the Department of War and Public Works in 1898 during the revolutionary government under the time of President Emilio Aguinaldo. In 1987, after several revolutions, it became the Department of Public Works and Highways, as it is known today.